What does it mean when your dentist autographs their work with excellence? It simply feels different when you walk into a store or an office where excellence is the standard. In an era when people are constantly bombarded with mediocrity and apathy through poor customer service and the performance of products below expectations, it is refreshing and reassuring to encounter excellence. Dental offices that consistently excel at customer service hire carefully and provide in-depth training for their employees. These offices personify excellence. out for your best interest now and in the future. Excellence cannot be static. The doctors and staff that you entrust with your dental health must continually seek new knowledge to enhance the predictability of their work and remain connected with exceptional colleagues who support continuing professional growth. Excellence is the sum of many parts. Attention to detail and accuracy of diagnosis, along with the skilled hands of an experienced dentist, will provide you efficient, informative, individualized treatment in a cost-effective manner. Your dentistry will be fabricated using the best materials available with a built-to-last attitude. 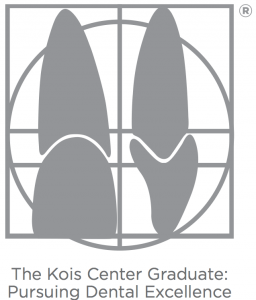 At the Kois Center, EXCELLENCE permeates every educational and interpersonal interaction—ALWAYS! This book is an overview of how Kois-trained dentists make excellence their standard and how you, their patient, will benefit.